Blogging live from the Driskill hotel in Austin, TX. This is a meeting offer by Google to learn more about Google Fiber and about the steps that follow to make that happen. Google has about 100 people working in Austin, some of them will be working directly with people in Austin to help with Google fiber. 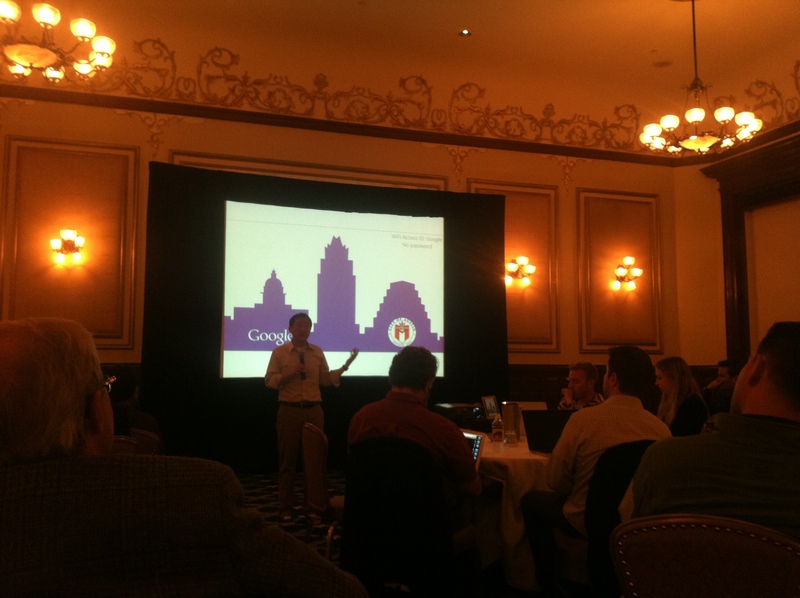 Fiber makes communities stronger – Kevin Lo, Google Fiber General Manager. Where will it be first? (Kevin Lo) We don’t know yet, within Austin city limits to start for sure. Will work with communities to find out where to go next, trying to be done within months and not years. Are you planning on doing something else besides just access (content, video, etc…) Kevin Lo: No, just the 3 packages displayed in our Google fiber page – for now. We do have a TV offering as well, we are focused on content that consumers want, local content. Do you consider UT campus a neighborhood? do they have priority over neighborhoods? Kevin Lo: Don’t have an answer for that at the moment. What about public institutions? Kevin Lo: We are aware of schools and other public buildings in the city are in need of a fast internet connection, our goal is to provide it. Is Google hiring Austinites for this project soon? Kevin Lo: I cannot answer that, Google has a small team already working in the city and it will be hiring contractors, etc but please do not reach out to Google to find out about job opportunities right now, we are still planning. What about marketing? are there any plans on when to start marketing Google fiber to Austin? Kevin Lo: We already have all the “traditional” marketing in place, we are working to create localized marketing with information and products that matter to Austin. For those individuals that live in apartments or other rented properties, is fiber is going to be available to us? Kevin Lo: Yes, definitely yes. When we started in Kansas city, apartments buildings were the first group that approached us about this, new constructions in Austin will already include Google fiber, that is the plan. What has been the impact of Google fiber in Kansas city? Kevin Lo: It is still too early to give you a good answer, we’ve been working in Kansas for about 1 year and a half. There are some examples of new “Hacker houses” being created where entrepreneurs gather to do their work, things like that. Are you going to offer the same 3 packages to small businesses? Kevin Lo: We have mentioned that we are going to have a plan to offer to small businesses. We think of a small business being a 20-40 people company and we are still working on it and will be announcing our small business offerings soon. Are you offering fiber outside of Austin, Williamson county for example? Kevin Lo: We are focusing in Austin, any cities outside of the city limits are not in our plans right now. We’ll be announcing more cities soon. What are your thoughts about AT&T announcement? Kevin Lo: We are very excited to learn about AT&T plans, gigabit speeds are the future of the internet and hearing other companies getting involved is very exciting to us as an industry. What are you going to do for elementary schools? Kevin Lo: We currently support schools in Kansas city but we are not education experts. We work and support the community with their efforts, including improving schools and the use of the web in classrooms. After today, when is your next community engagement? Kevin Lo: We have many meetings and community gatherings in the next few months, sign up on Google fiber’s website to keep up with news, etc..
What have you learned from your experience with Kansas city? Kevin Lo: It is truly important to engage with the community early, just getting involved and staying involved is our top priority. What is doing Google to actually work directly with communities as opposed to working with city governments, private vs. public entities? Kevin Lo: I cannot answer that (laughs). We just want to assure everyone that Google fiber will be everywhere in 20 years, we are working really hard to make it happen.